With the recent launch of several low cost Cortex A53 development boards, 64-bit ARM hardware is now pretty common and inexpensive, but if you want to run 64-bit ARM code on your x86 Linux computer, Riku Voipio, a software engineer working for Linaro, wrote some instructions to run Ubuntu 16.04 Aarch64 Cloud image in QEMU. Ubuntu cloud images are “the official Ubuntu images and are pre-installed disk images that have been customized by Ubuntu engineering to run on public clouds that provide Ubuntu Certified Images, Openstack, LXD, and more. ” So the instructions are also useful if you want to easily try such packages on 64-bit ARM platform. I’ve tried those instructions myself on my Ubuntu 14.04 machine with and AMD FX8350 processor, and they worked pretty well, and the only things I had to find out by myself was to install a recent version of qemu. You simply need to change the file with your username, and RSA key, which should be in ~/.ssh/id_rsa.pub. If you don’t have that file you may want to read my post showing how to create the SSH key and login without password. Cloud config can take many arguments, including packages to install during the first boot, and you can learn all about it on Cloud-init documentation. [ 0.000000] Architected cp15 timer(s) running at 62.50MHz (virt). [ 0.009610] Yama: becoming mindful. [ 0.725663] Remapping and enabling EFI services. [ 0.749201] SMP: Total of 2 processors activated. [ 0.778658] SMBIOS 3.0.0 present. [ 0.824292] hw-breakpoint: found 6 breakpoint and 4 watchpoint registers. [ 0.946328] ACPI: Interpreter disabled. [ 38.533202] Allocating IMA MOK and blacklist keyrings. [ 39.136679] ima: No TPM chip found, activating TPM-bypass! [ 52.425729] systemd: System time before build time, advancing clock. [ 52.602459] systemd: Detected virtualization qemu. [ 52.602901] systemd: Detected architecture arm64.Welcome to Ubuntu 16.04 LTS! [ 52.615513] systemd: Set hostname to . [ 52.631062] systemd: Initializing machine ID from random generator. [ 52.633892] systemd: Installed transient /etc/machine-id file. [ 54.777420] systemd: Created slice System Slice. [ 54.787015] systemd: Created slice system-getty.slice. [ 54.791265] systemd: Listening on Journal Socket. [ 54.839431] systemd: Reached target User and Group Name Lookups. [ OK ] Reached target User and Group Name Lookups. [ 54.900677] systemd: Listening on Journal Audit Socket. [ 54.937520] systemd: Listening on Syslog Socket. [ 55.125920] systemd: Created slice system-serial\x2dgetty.slice. [ 55.130335] systemd: Listening on udev Control Socket. [ 55.166043] systemd: Listening on /dev/initctl Compatibility Named Pipe. [ 55.203000] systemd: Created slice User and Session Slice. [ 55.230696] systemd: Started Forward Password Requests to Wall Directory Watch. [ 55.302712] systemd: Set up automount Arbitrary Executable File Formats File System Automount Point. [ OK ] Set up automount Arbitrary Executab…ats File System Automount Point. [ 55.342570] systemd: Listening on LVM2 metadata daemon socket. [ 55.478207] systemd: Reached target Swap. [ 55.505859] systemd: Reached target Slices. [ 55.671273] systemd: Reached target Encrypted Volumes. [ 55.895229] systemd: Listening on Journal Socket (/dev/log). [ 55.978436] systemd: Listening on Device-mapper event daemon FIFOs. [ 56.039144] systemd: Listening on udev Kernel Socket. [ 56.393745] systemd: Listening on LVM2 poll daemon socket. [ 57.001027] systemd: Mounted POSIX Message Queue File System. [ 57.064715] systemd: Mounted Debug File System. [ 57.101124] systemd: Mounted Huge Pages File System. [ 57.227288] systemd: Started Create list of required static device nodes for the current kernel. [ OK ] Started Create list of required sta…ce nodes for the current kernel. [ 57.258454] systemd: Started Uncomplicated firewall. [ OK ] Started Uncomplicated firewall. [ 57.527628] systemd: Started Remount Root and Kernel File Systems. [ 58.358611] systemd: Started Nameserver information manager. [ 59.850589] Loading iSCSI transport class v2.0-870. [ 60.059388] systemd: Started LVM2 metadata daemon. [ 60.630029] systemd: Started Journal Service. [ OK ] Started Monitoring of LVM2 mirrors,…ng dmeventd or progress polling. [ OK ] Found device /dev/ttyAMA0. [ OK ] Found device /dev/disk/by-label/UEFI. [FAILED] Failed to start Set console keymap. See ‘systemctl status console-setup.service’ for details. [ OK ] Started Commit a transient machine-id on disk. [ OK ] Started LSB: AppArmor initialization. Starting LXD – unix socket. [ OK ] Listening on Socket activation for snappy daemon. [ OK ] Listening on LXD – unix socket. [ OK ] Started FUSE filesystem for LXC. [ OK ] Started LSB: Record successful boot for GRUB. [ OK ] Started LSB: MD monitoring daemon. [ OK ] Started Seed the pseudo random number generator on first boot. [ OK ] Started LXD – container startup/shutdown. [ 137.551732] cloud-init: Cloud-init v. 0.7.7 running ‘init-local’ at Thu, 11 Feb 2016 16:29:14 +0000. Up 126.47 seconds. [ 183.824988] cloud-init: Cloud-init v. 0.7.7 running ‘init’ at Tue, 10 May 2016 13:09:14 +0000. Up 162.17 seconds. [ 184.251771] cloud-init: Generating public/private rsa key pair. [ 184.267717] cloud-init: Your identification has been saved in /etc/ssh/ssh_host_rsa_key. [ 184.287923] cloud-init: Your public key has been saved in /etc/ssh/ssh_host_rsa_key.pub. [ 184.723963] cloud-init: Generating public/private dsa key pair. [ 184.747842] cloud-init: Your identification has been saved in /etc/ssh/ssh_host_dsa_key. [ 184.768001] cloud-init: Your public key has been saved in /etc/ssh/ssh_host_dsa_key.pub. [ OK ] Started Initial cloud-init job (metadata service crawler). [ 186.585582] cloud-init: Generating public/private ecdsa key pair. [ 186.609651] cloud-init: Your identification has been saved in /etc/ssh/ssh_host_ecdsa_key. [ 186.625636] cloud-init: Your public key has been saved in /etc/ssh/ssh_host_ecdsa_key.pub. [ 188.540492] cloud-init: Generating public/private ed25519 key pair. [ OK ] Started iSCSI initiator daemon (iscsid). [ 188.655394] cloud-init: Your identification has been saved in /etc/ssh/ssh_host_ed25519_key. [ 188.804741] cloud-init: Your public key has been saved in /etc/ssh/ssh_host_ed25519_key.pub. [ OK ] Started Login to default iSCSI targets. [ OK ] Started Serial Getty on ttyAMA0. [ OK ] Started LSB: Set the CPU Frequency Scaling governor to “ondemand”. [ OK ] Started LSB: daemon to balance interrupts for SMP systems. No password will be asked since we’re using an ssh key. Emulation from x86 to ARM is affecting the results quite a bit here. For reference, a Raspberry Pi 2 achieves about 113300 KFLOPS for the same benchmark. You’ll also noticed specifically compiling for Cortex-A57 CPU improves the performance by about 10%, even in qemu. Thanks a lot for writing this up. I’m struggling to get this working, and have tried a few formulas including yours. [FAILED] Failed to start Initial cloud-init job (metadata service crawler). See ‘systemctl status cloud-init.service’ for details. So, I gather that /var/lib/cloud/instance is not a directory, i.e., probably doesn’t exist? Have you seen such a thing before, and any suggestions? I have not been playing with the image much, and I’m not sure what your exact issue may be. I don’t have /var/lib/cloud inside my host system (Ubuntu 14.04), so that’s probably within the cloud image itself. I can see the update the image daily, so a bug may have been introduced in the image. My log only read at the stage of your error. Thanks! I pulled a fresh image, and now everything works as expected. Thank you for the great post! I followed all your steps and I also have a Ubuntu 14.04 with AMD64 CPU. However, in the last phase of ssh to the 2222 port of the local host, I always get the error message of “Permission denied (publickey)”. I can ssh to my localhost without typing any passwords. Just the port 2222 always fails on me. Any suggestions? Thanks! Double check your key @ ssh-authorized-keys: – ssh-rsa AAAAB3NzaC1y…. Is there any way to know the username and password of the cloud image so that we could login directly from that console? I can see [email protected] is missing from the key in cloud-config. Maybe that’s the reason. I don’t think there’s a default username/password for the cloud image, everything is defined in cloud-config. This is a great write-up. It is recent, concise and clear. Most of all, it is a lifesaver for me. Just one update, with ubuntu 16.04.01, one can directly install qemu-system-aarch64 2.5, sudo apt-get install qemu-system-arm. The instructions have left out the installation of cloud-init! It is not included in cloud-utils. does nothing without a peep. Is it possible to use an existing Cortex-A53 image after replacing the kernel, etc? The authenticity of host ‘[localhost]:2222 ([127.0.0.1]:2222)’ can’t be established. ECDSA key fingerprint is SHA256:/K+RpJF5+bjHKlmdD7U7lB5EhemsUDD/KNXsntu0MuI. Warning: Permanently added ‘[localhost]:2222’ (ECDSA) to the list of known hosts. debug1: Connecting to localhost [127.0.0.1] port 2222.
debug1: Host ‘[localhost]:2222’ is known and matches the ECDSA host key. Maybe something changed since I posted the instructions. It might be possible to do that. You’d have to check cloud-init documentation. 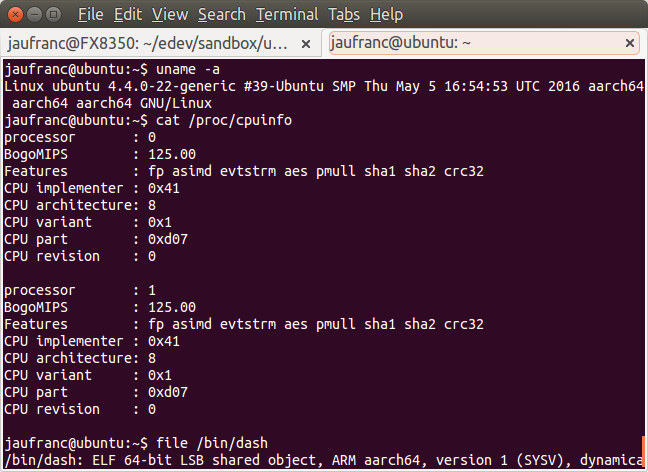 I also can not pass ssh key via this config file, so I just added new user to ubuntu and logged with it. then you will boot up with root console. 6. reboot or kill qemu and boot again. check that you provided init=/bin/bash on right line. when i do $ifconfig eth0 , it hanged. @aaguro , @cnxsoft Any luck on ssh ? I am still not able to ssh with the keypair setup . I tried as mentioned by aaguro. Did you use the whole string with [email protected] or whatever you might have at the end? Also when generating the ssh key with “ssh-keygen -t rsa -f .ssh/id_rsa” don’t use it with sudo, for me it placed it in the root files which didn’t work. And don’t forget to rebuild the cloud img when you change smth. Another thing to add I always reset the Ubuntu image when I rebuild the cloud image so I have the original one from the download. Sorry this is wrong, it created a keypair in the specified folder as [email protected] user instead of [email protected] so you have like ssh-rsa AAAAB3N … [email protected] I guess it works like this but then you have to use sudo when calling “ssh -p 2222 [email protected]” and also place the rsa key into the “/root/.ssh/” directory instead of the “~/.ssh/”. So the easiest way is not using sudo when calling “ssh-keygen -t rsa -f ~/.ssh/id_rsa” and “ssh -p 2222 [email protected]”. Thanks a lot for helping out here. It finally worked after trying out the [email protected] and rebuilding the cloud image.